With our storm damage repair services in Orillia, ON, we’ll get your roof fixed in no time. A huge wind, hail, or lightning storm can cause your roof to incur serious damage. However, detecting that your roof is in need of storm damage repair services from a qualified, experienced roofing company is easier said than done. Luckily, you have us at Slippery Slope Roofing to help. If you think that your roof is in need of storm damage repair, we recommend doing a visual inspection of your roof. During this inspection, you should look for signs of leaks or water damage in your home’s attic and signs of storm damage that may be noticeable from the ground. For example, your roof may need to be repaired if there are chunks of metal from around your chimney or pieces of your shingles on your lawn. 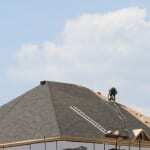 We realize that while you are looking for storm damage, you may be tempted to go up on top of your roof. However, it’s essential that you leave this part of the storm damage repair process up to our team of professionals. When we come to look at your roof, we’ll figure out how extensive the damage is and then come up with an effective plan for fixing it. Before we get to work on the storm damage repair process, we’ll take the time to go over what needs to be done with you. Doing this is just one of the many ways that we demonstrate to you that we truly care about your satisfaction. If you want to know more about our storm damage repair services in the Orillia, Ontario area, contact us at Slippery Slope Roofing today.